Packed. Checked out. Arrived at airport. Its time to head home. Wait. The airlines however decided otherwise. Our flight was retimed a.k.a flight cancelled for the day. Earliest one out was 18 hours later. But thanks to the airlines we got to stay one more night in India. And wait, it gets even better, they put us up at Kovalam. 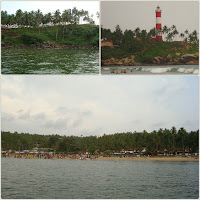 If you are wondering what is so special about Kovalam, well it is regarded as one of the best beaches in India. 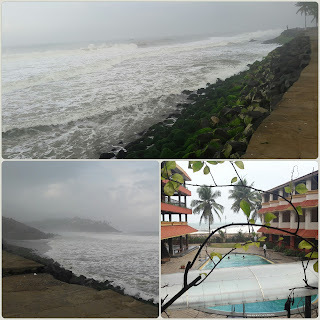 Kovalam is approximately 10KMs away from Trivandrum airport. My view for the next couple of hours would be of the great Arabian sea. 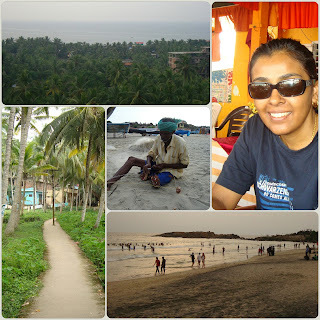 Kovalam means grove of coconut trees and there are countless numbers of them. This is my second visit to this coastal township. The first time was back in the new year of 2012 when we stayed at the Hawah beach and now at Samudra beach. 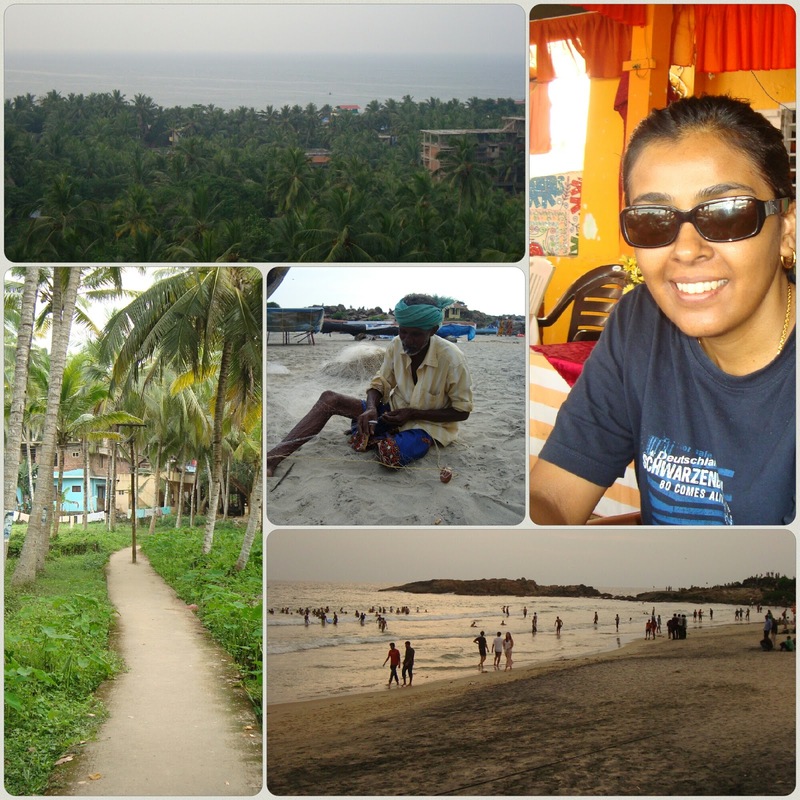 Kovalam has a 17 KM coastline and 3 stunning beaches. The third is the Lighthouse beach. Since my recent stay was just an overnight one, it was just enough to capture the images of the mighty lashing waves on the rocky stones. This is indeed an awesome sight. 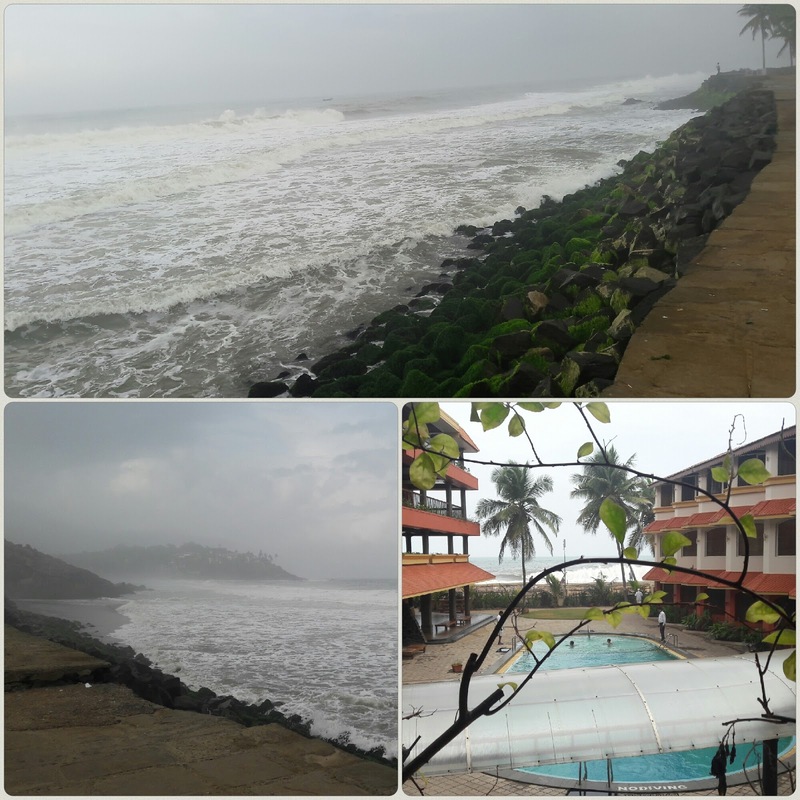 I spent a fair bit of my morning just watching, watching and watching the waves of varying heights and intensity. Surfing is popular here, but I didn’t see any surfers that morning. The sea was expected to be rough for the next few days. The coffee in this picture is from the coffee station at Samudra hotels restaurant. 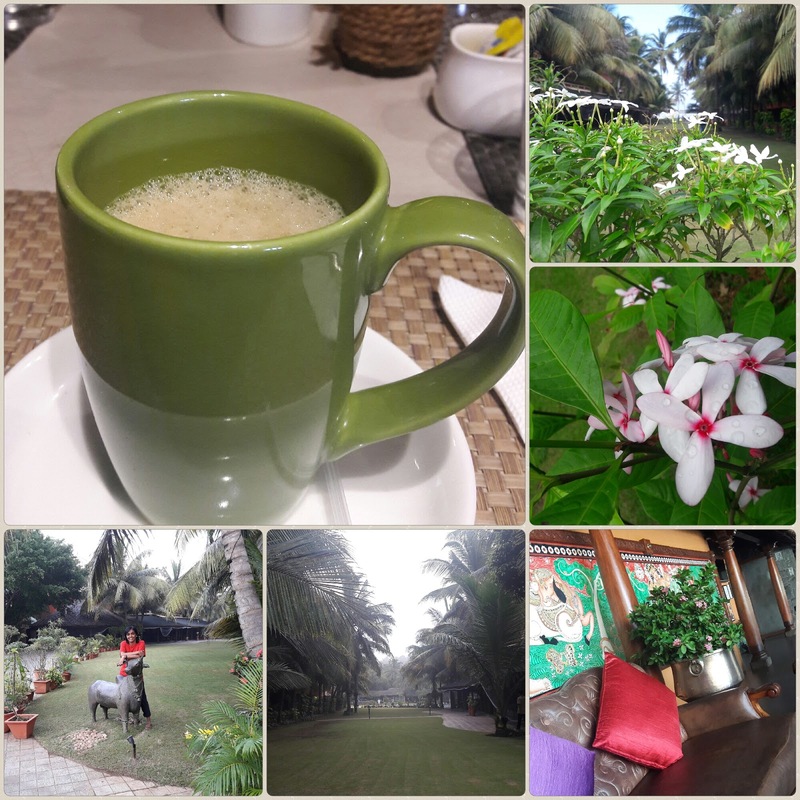 Hot Indian filter coffee, of course in happy green mugs, an eco-friendly colour, complementing the organic breakfast they served. The coffee station's hut-like setup adds on a traditional touch to its preparation. The staff at the restaurant and at all work station points in the hotel (reception, security, house keeping, etc) were simply delightful, the coffee's character speaks for itself. 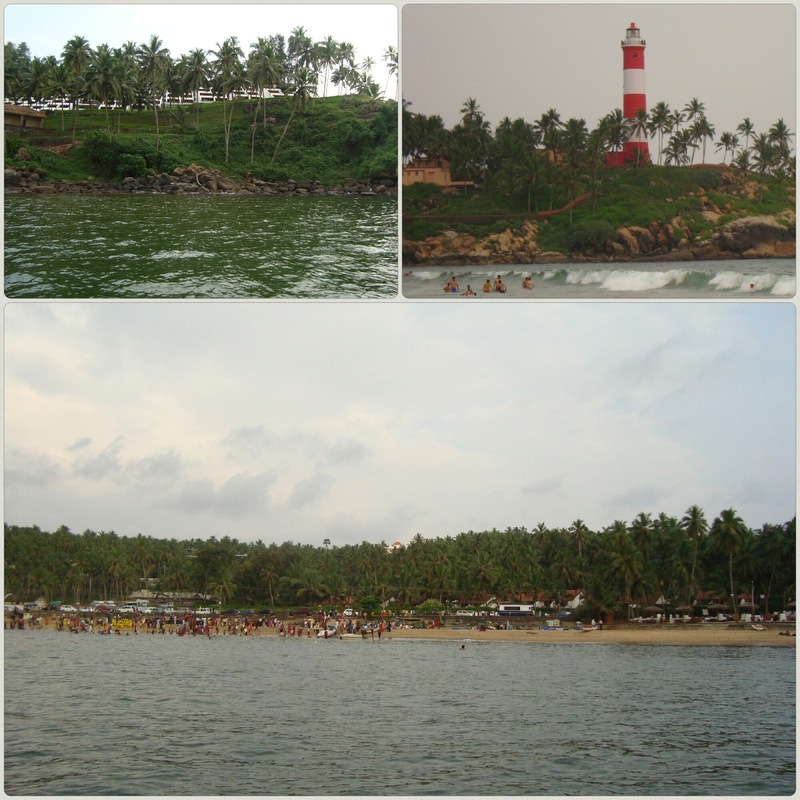 Tourism and fishing contributes to the domestic economy in Kovalam. There are plenty of accommodation and dining options to choose from. The atmosphere is relaxed, grab a drink, watch the waves, watch the people, watch the sun set. Chillllllll! For me the recreational highlight of Kerala is the Ayurvedic treatments. It is one of the oldest medical systems that originated from India. Ayurveda is regarded as alternate or complementary medicine and sometimes is integrated with western treatment. At Kovalam, Ayurvedic treatments/massages are provided at the resorts. I had tried this only once during my first visit. The quality was top-notch, the effects were instant, the years of accumulated toxin was washed away and my face looked really fresh. Most, if not all, centres have in-house doctors who evaluate and recommend suitable treatments for the guests. From earlier files, how could I resist? During both stays, the green sea was choppy, my speed boat ride back in 2012 as I recall was not as smooth as I would have liked it. My head felt so much like those coconuts on the trees being shaken rigorously and if that ride hadn’t stopped, my brains would have popped out volunteering. The experience is a must though, at least I know how a coconut feels now. I missed some important work commitment the next day due to the flight delay, something beyond my control. In return, I got to stay in India for a few more hours and in another coastal town, and because of this, the night in Kovalam is now part of my coffee trail experiences. The skies were clear, the Arabian roared louder with each crashing wave. I saw countless stars shining that night, each felt so near. I wouldn’t trade this feeling for anything else. This entry concludes my 3-part coffee trail to south Indian coastal towns. While I mentioned some of the great seas over the last 3 postings, greater still is their forces of nature. And nature once again has proved more powerful than all of us combined. My sincere thoughts and prayers for everyone affected by the recent hurricanes and floodings globally. Stay safe always.